This information was borrowed from “What is Depth Psychology” at Cgjungcenter.org. Sandplay is hands on psychological work. It is a powerful therapeutic technique that facilitates the psyche’s natural capacity for healing. In a “free and protected” space provided by the analyst, a client creates a concrete manifestation of his or her imaginal world using sand, water, and miniature objects. In this way Sandplay helps honor and illuminate the client’s internal symbolic world and provides a place for its expression within a safe container, the tray filled with sand. 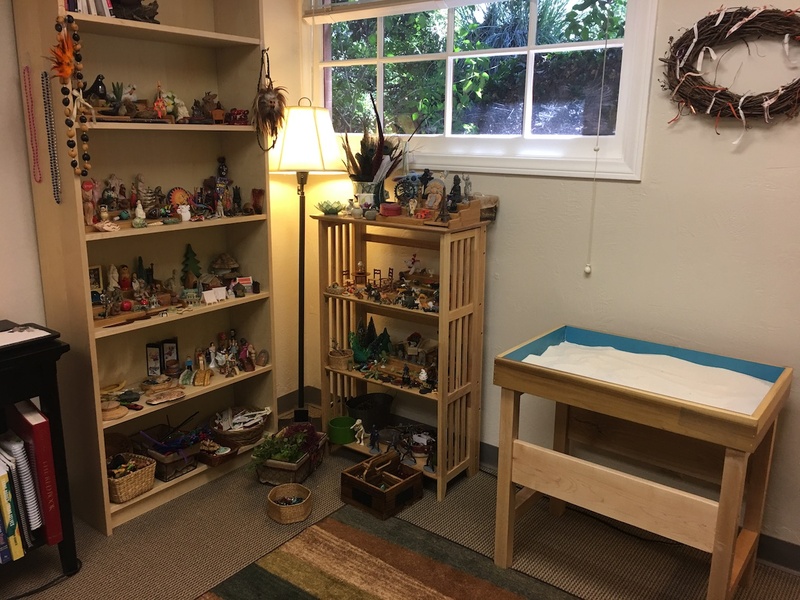 Sandplay is done adjunctively to talk therapy during the process of the therapeutic work. Through the tangible emergence of personal and archetypal symbols, Sandplay has the possibility of leading the client into layers of experience that are often pre-verbal and long forgotten to the conscious mind. With sufficient time and understanding, this experience can lead to the development of a new psychic structure of the personality. In Sandplay a scene is made from figures and objects placed in a box of sand. The construction of the scene is guided almost entirely by the choices made by the hands of the client, while the analyst watches nearby in respectful silence. Developed by Swiss Jungian Analyst Dora Kalff (see image), Sandplay is a form of therapy that gives both child and adult clients the opportunity to portray, rather than verbalize, feelings and experiences often inaccessible and/or difficult to express in words. Sandplay also provides a balance to the extraverted, verbal, and outer-focused everyday world. It can lead to a more open and integrated way of life. In the midst of an age and time that rushes toward the future, the simplicity and depth of Sandplay helps maintain a place of internal integrity as well as a sanctuary for contact with the symbolic world out of which can emerge a healing experience. A basic premise of Sandplay therapy is that the psyche possesses a natural tendency to heal itself, given the proper conditions. Similar to how our physical wounds heal under beneficial conditions, the psyche also has an instinctual wisdom that emerges when left free to operate naturally in a protected environment. The aim of Sandplay is to activate healing energies at the deepest level of the psyche through the use of miniatures and the sand tray to reflect the client’s inner world. By this symbolic activity and through the experience of free and creative play, unconscious processes are made visible in this three-dimensional form, much like the dream experience. The archetypal world expresses itself in symbols; those symbols act as a bridge between our inner and outer worlds. With the use of images (i.e., the miniatures on the nearby shelves) in the safe space provided by the analyst, the making of the sand creation begins to unfold. It is in this creative play in the sand where the ancient archetypal patters that live within us are explored. And it is the very action of Sandplay – that is, the viewing, personal choosing, and the placing of the miniatures in the sand – that activates this powerful internal archetypal dimension. In this experience of making a sand creation, done much like an active imagination, it is important that the sandplayer does not focus on any kind of cognitive processing or on any completed “finished” production. It is also important that the sand pictures, when completed, are not interpreted during the tray making process so that the client can stay close to the living experience and not be distracted. The analyst remains close by, a silent witness, who primarily reverberates empathically to the client creating the tray. Any verbal interpretation at this time can easily subvert a process which must, first and foremost, remain somewhat beyond language and thinking. The silence helps to contain and honor the experience so that what has been expressed can continue reverberating within the client. After the client leaves a Sandplay session, the therapist photographs the scene; this picture is then stored with the client’s other Sandplay photos, awaiting completion of the Sandplay process. It is only when the entire Sandplay process seems to come to a rest, the client and therapist may then mutually decide to view the photographs of the trays that have been created. It is at this time that the analyst may give a more analytical interpretation of the sand creations, reflecting on and deciphering the content of the trays and the process itself. Providing such a window into the unconscious deepens conscious understanding of the individual psyche and provides a framework for future verbal therapy. Since Sandplay is one of the few therapeutic techniques in which language skills are unnecessary for understanding the expressions of the psyche, it has truly become a cross-cultural method that is now practiced therapeutically worldwide. Within this ever-shrinking world, Sandplay now offers us a unique opportunity to view universal, archetypal patterns as well as observe the unfolding development of the individual psyche.